Let me say FIRST, that NOT ALL CHERA's CHOCOLATE COVERED FEBRUARY will be in PINK /RED.... Traditional Valentine colors.. ok? With that stated, I feel confident that even if you aren't crazy about the color cardstock you will still love the items.... so lets get on with it. I HAVE COOKIES TODAY!!!! A COOKIE BOX that will hold a DOZEN (bakers dozen even) COOKIES.. but since I have made "snack size" cookies, I fit about 15 in here. Anyone who has teens understand that if you want cookies to last more than 'fresh out of the oven' you make them smaller than normal and which would produce more. I used this tutorial from Natasha Zandbergen, SU! Canada Demo. Its super easy and fun! Go ahead give it a shot. ﻿ This is going south ... to a fellow who with just a touch of feminine will be alright with getting this. .. of course its loaded with Cowboy Cookies * ... who wouldn't want it? Recipe for Cowboy Cookies is here . LEAVE ME SOME LOVE AND YOUR NAME WILL BE ENTERED TO WIN SOME BLOG CANDY! The tag on your box is just perfect, super cute! Your tag is super cute. You have me intrigued. What are Cowboy Cookies? Watch out for the cookie monster. Love the tag and flower. Very pretty embellishments. SO CUTE! I am brand new to SU and went to my first card class a few weeks ago - now I'm so hooked. I LOVE your cookie box idea as I bake alot (thanks for sharing thecowboy cookie recipe). I'm so glad I found this group - awesome job & pics! 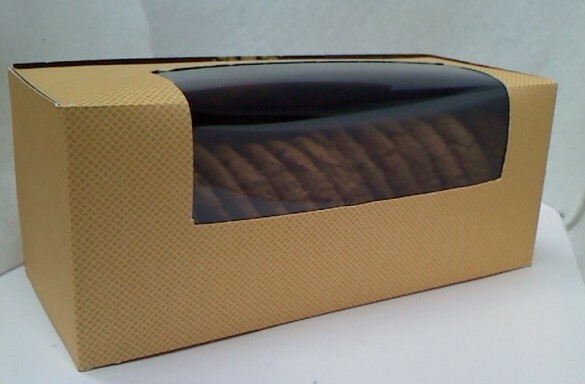 Mmmm, Mmmmmm good looking cookie box! How clever to come up with so many ideas for V-day! Thanks for sharing your ideas! That fellow is going to know you are all girl! Love the tag! It is so feminine, as most fellows love! OMG the coookies looooook sooooooo Yummy! being a baker, gotta love it. Cookies leave this house with great regularity, as do muffins and bread. Great idea and will be greeted with huge smiles at the other end am sure. I can't get cookies to last out of the oven to cool let alone place into a cute box. I have 2 teenage boys who love cookies and come running when I make them. Their friends will even smell them in the air and drive over to make sure they are edible!! 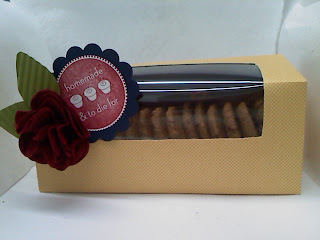 I will definately try to make the box and put something yummy inside for my friends at work! Thanks so much for the idea! Great box girl. Love it. But can you share the "cowboy cookies" recipe with us? I love this box! If I baked cookies I'd have to make one. ha ha! Love the box and the tag, and I love cowboy cookies!! Will definitely have to make some of these again soon. Thanks for the chance to win some blog candy. 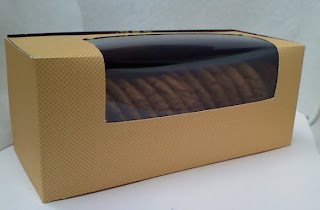 Your cookie box is beautiful, what a great way to display such a wonderful gift. I printed the recipe for Cowboy Cookies, plan to bake them in the morning. Thanks for the inspiration and chance to win some great gifts. This is a fantastic box!! The stamp is perfect and I love the embellishments. Whoever is getting this box is one lucky person indeed!! Oh my gosh, you are making my stomach growl big time -- I AM SO HUNGRY RIGHT NOW!! Yes, I am getting the recipe but want the whole box now. 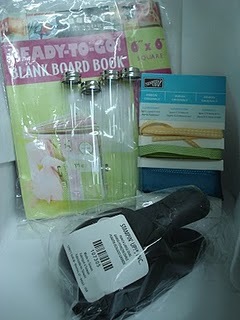 Your box is perfect for a man thank you so much for sharing this idea and the blog candy. That is an adorable way to deliver cookies! In my old neighborhood my neighbor Marian always brought cookies over covered in tin foil. I should make up some boxes for her as a gift, she would love to have a beautiful package for her home baked goodies. Thanks for sharing. So often we bake up something and have enough to send over to a neighbor and I HATE putting them in a blah baggie. This is perfect!!! Really puts that *extra something* in the gift. I really like the box, thank you!! and thanks for the opportunity to win some blog candy! Gosh, I don't know which is a greater treat! The recipe or the box!! Thank you so very much for both!